For twenty-five hundred years Buddhism has taught that everyone is Buddha—already enlightened, lacking nothing. But still there is the question of how we can experience that truth in our lives. In this book, Dainin Katagiri points to the manifestation of enlightenment right here, right now, in our everyday routine. Genuineness of practice lies in "just living" our lives wholeheartedly. The Zen practice of sitting meditation (zazen) is this not a means to an end but is the activity of enlightenment itself. That is why Katagiri Roshi says, "Don't expect enlightenment—just sit down!" 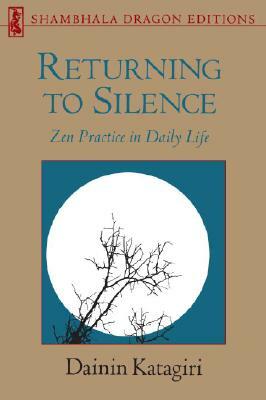 Based on the author's talks to his American students, Returning to Silence contains the basic teachings of the Buddha, with special emphasis on the meaning of faith and on meditation. It also offers a commentary on "The Bodhisattva's Four Methods of Guidance" from Dogen Zenji's Shobogenzo, which speaks in depth about the appropriate actions of those who guide others in the practice of the Buddha Way. Throughout these pages, Katagiri Roshi energetically brings to life the message that "Buddha is your daily life." Born in Osaka, Japan, in 1928, Dainin Katagiri was trained traditionally as a Zen teacher. He first came to the United States in 1963, to help with a Soto Zen Temple in Los Angeles. He later joined Shunryu Suzuki Roshi at the San Francisco Zen Center and taught there until Suzuki Roshi’s death in 1971. He was then invited to form a new Zen center in Minneapolis, which, in addition to a monastery in the countryside of Minnesota, he oversaw until his death in 1990. He left behind a legacy of recorded teachings and twelve Dharma heirs. Katagiri is the author of several books, including Returning to Silence and You Have to Say Something.